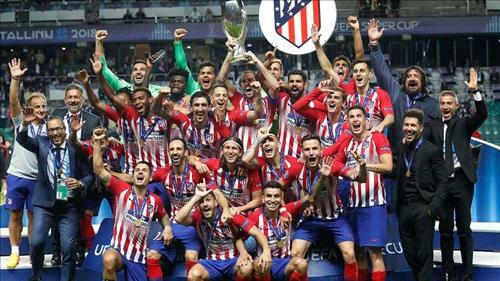 AMMONNEWS - Atletico Madrid finally got the better of Real Madrid on the European stage, scoring twice in extra time to win 4-2 in the UEFA Super Cup final on Wednesday in its rival’s first game without Cristiano Ronaldo. Atletico’s victory was over its crosstown rival had added significance after it lost two Champions League finals to Madrid in 2014 and 2016. Diego Simeone’s team was also eliminated by Madrid in the 2017 semifinals. The loss leaves new Madrid coach Julen Lopetegui still having to prove that there is life after Ronaldo, who scored 450 goals in 438 matches before joining Juventus this summer and helped lead the club to three straight Champions League titles. Gareth Bale showed glimpses of his pace and skill, but couldn’t mimic Ronaldo’s ability to decide a game on his own. Karim Benzema equalized in the 27th minute, heading in a pinpoint cross from Bale, who was able to break away from Lucas Hernandez on the right and curl the ball into his fellow forward’s path. Bale, who was given a freer role than he’s used to, caused trouble for Atletico’s defense in the first half as he switched between wings. He was Madrid’s main creative spark at that point, with his teammates constantly trying to feed him the ball.